The documentary picture has seen something of a renaissance in recent years, perhaps most notably with the critical acclaim poured upon Andrew Jarecki’s excellent Capturing the Friedman’s and the huge commercial success of Michael Moore’s Fahrenheit 911. You can see the appeal in the genre for both studios and film-makers – a ready made cast of characters tied to a product that is so cheap to produce that it can afford to take genuine risks. However, at first glance a two and a quarter hour movie about wine-makers might still seem a little esoteric for most cinemagoers. And while an appreciation of wine (and wine history) would admittedly go some way to enhancing Jonathan Nossiter’s effort, there are so many ideas and meanings behind Mondovino that it proves fascinating in a whole number of other ways. 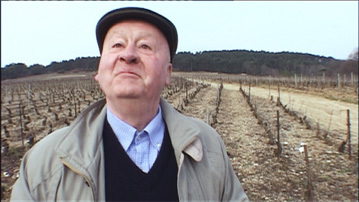 The film sees Nossiter journey through several countries to lay bare the global wine industry and some of the faces behind it. From San Francisco to Sardinia and from Argentina to Bourdeux he finds very different characters with widely conflicting ideas on the significance behind winemaking. First there are the huge multi-nationals, represented by the likes of chortling French wine consultant Michel Rolland and the vast empire of the Mondavi family. To them progress and profits are everything, and nothing should stand in the way of perpetual expansion of business. Countering these bigwigs there are what Rolland derogatorily dismisses as “peasants”, like Sardinian wine maker Battista Columba or the amiable Hubert De Montille from Burgundy. To them wine is synonymous with tradition, beauty and personal freedom. These are people immensely cynical about both the encroachment of Big Business on the lifestyle that they love and the homogenisation of winemaking that technology affords (watch out for those “whore wines” on your next trip to Threshers). Okay okay, so it doesn’t sound the stuff likely to set adrenaline racing. Yet, intriguingly, as the film progresses there emerges a distinct ‘politics of wine’ bubbling just beneath the surface. On the one hand the suits of the multinationals proudly flaunt photos of themselves shaking hands with Republican presidents; on the other a Communist mayor in the town of Aniane causes controversy by fighting off a bid by wine giant Pomeral on local vineyards. The big companies dream of achieving a singular perfect wine; the small winegrowers espouse talk of freedom of choice. Could vineyards really a political battleground in an increasingly monolithic, globalised society? Then there’s the hugely influential wine critic Robert Parker. The wine multi-nationals have huge respect for the first superstar of wine journalism (and are often close personal acquaintances), and wax lyrical on how Parker has single-handedly taken the elitism out of wine drinking. Yet the smaller winemakers view him as yet another contributor to the uniformity of wine culture, with the industry personally tailoring its market for the tastes of what a select few declare is the perfect wine. These are just some the issues the movie delves into. There isn’t room in a single review to go into the array of other themes at work here, but Mondovino is almost disturbing in revealing the layers of meaning behind the apparently mundane. Of course, as any good media studies student will tell you, documentary is as much of a ‘construction’ as fiction. This is a film painstakingly edited together to map out a clear narrative and, while not entirely dogmatic, Nossiter does have own anti-globalisation agenda. After all, it hardly seems a coincidence that the wealthy Marchioness Bona is interviewed in Florence the same day that anti-capitalist demonstrations hit town. This is a conscious story about the destruction of individuality and the exploitation of the poor by the privileged, where every awkward pause is left in for a reason. The corporate Chief Executives are only too aware of the dangers of documentary filmmaking, and often insist on being filmed in certain ways – though are usually left looking no less ridiculous. Yet whatever your take on globalisation, these are a mostly charming collection of heroes and villains to spend company with. Mondovino is sometimes confusing in its cutting back and forth between so many characters and locations, and it is not always easy to remember who everyone is and their exact relationship with one another. Perhaps this an inevitable result of being streamlined from an original ten-hour series. It is also a rather leisurely-paced film, taking time to build up its ideas and focus. But those with a little patience are left with a subtle, fascinating little movie that is at once a political essay, a travelogue and a wine connoisseur’s dream – even Michael Moore didn’t manage all three.